I am going to start posting more of the recipes that I have tried on here since I do cook quite a bit a whole lot. Many of the recipes are going to come from pinterest pins on my boards, cookbooks, and some from cooking blogs. 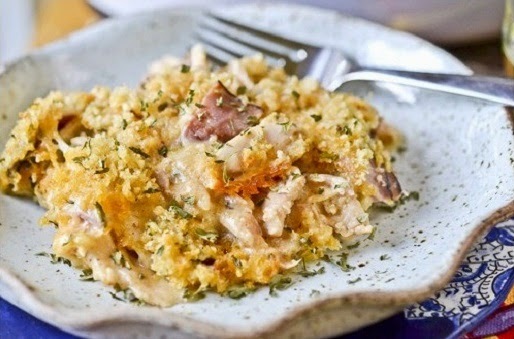 This first one is Low-Carb Chicken Cordon Bleu Casserole. This recipe is from a site called Food is My Friend. I did change sub some of the items out due to the lifestyle change that I made in April (that is what I am calling it now). I used gluten-free flour instead of regular. I also did spicy brown mustard and Dijon mustard together. I am using the pictures from the website because they look a whole lot better than mine. Bake casserole uncovered for 45 minutes until hot and bubbly throughout and topping has turned a light golden brown (I let mine cook under the broiler for 2 to 3 minutes). Remove from oven and allow to cool for 5-10 minutes prior to serving.